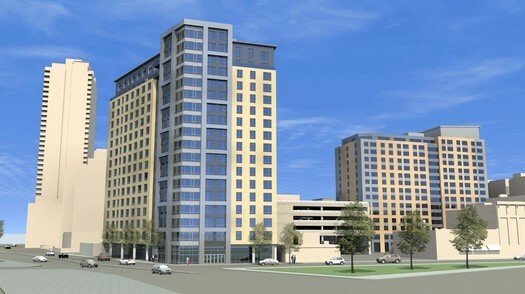 CBRE Capital Markets’ Debt & Structured Finance team has arranged a $51.3 million construction loan for the development of Park Square West Phase IV Apartments, a 209-unit, luxury high-rise apartment building in Stamford, Connecticut. CBRE arranged the LIBOR-based, floating-rate construction loan on behalf of a joint venture between entities controlled by Trinity Financial and Berkshire Group. CBRE also arranged the joint venture between the two. Financing was provided by Citizens Bank. The loan was facilitated by Mark Fisher and Alex Furnary of CBRE’s Midtown Manhattan office. The development is Trinity’s second project in Stamford after its successful completion of 66 Summer Street. “Part of our success in financing both 66 Summer and the Park Square West Phase IV projects were thanks to CBRE’s phenomenal knowledge of the market and its extensive network,” said Maixuan Phan, Senior Project Manager for Trinity’s Stamford development. Located at 1011 Washington Boulevard, the building will be constructed of concrete, stone, steel and glass. The property will provide residents with an impressive amenity package, including a roof deck lounge with fire pits, private indoor catering area, residents lounge, club room with kitchen, game room, yoga studio, screening room, children’s playroom and pet wash. Several of the units will offer sweeping views of the Mill River Park, while the upper floor units will provide views of the Long Island Sound. All units will boast high-end fit and finish. “We believe location is the building’s biggest amenity. You are literally within walking distance of everything,” Fisher added.